Sally Kempton is one of today’s most authentic spiritual teachers. She offers heart-to-heart transmission in meditation and life practice through her Awakened Heart Tantra workshops, teleclasses, retreats, and trainings in applied spiritual philosophy. Her workshops and teleconference courses integrate the wisdom of traditional yoga tantra with the insights of contemporary evolutionary spirituality and cutting-edge psychology. Sally is the author of Meditation for the Love of It, a groundbreaking book on meditation. She writes a regular column, Wisdom, for Yoga Journal. 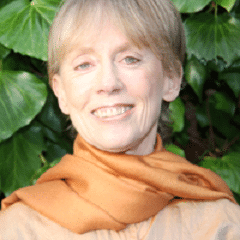 She is one of a select group of teachers in Ken Wilber’s Integral Spiritual Center, and teaches regularly at conferences, and at Kripalu and Esalen. and it is not about traditions. (dont know what all you will bring in to suporpt your reasons). its simply about let﻿ people make their own choices. their inner self will tell them the way ahead. they will get the right people at the right point of time in their lives. and what is wrong or right? there is just cause and effect. its the law of nature. one does wrong one begets wrong. one does right one begets right. so why dont you let the law of nature take its course.